A BLACKSTONE STELA OF SURYA THE SUN GOD, Pala period, 10th.-11th cent. Finely detailed warrior on horseback holding a bow in his right hand. Fully equipped with detailed armor in cobolt blue and turqoise glaze. Other details in white, black and red pigment. A high quality figure. The figure is part of a group where several specimens was TL-tested by the Kotalla Lab. Guaranteed authentic for life and comes with our COA. A rare and authentic Chinese 'flycatcher' Jade pendant in the shape of a Rodent, perhaps a Rat, dating to the Han Dynasty, 200 BC-200 AD. This axe is fine a real gem with the most convincing beautiful ancient surface! The axe displays on each side the fine relief engraving of an Ox or Bull and with panels of spirals near the drilled hole. 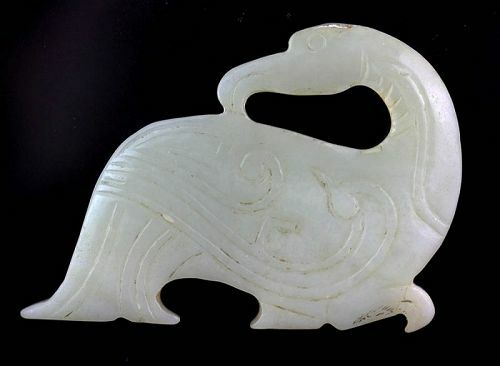 A very rare and beautiful Nephrite Jade Bull pendant, provenanced to the world famous Peony Collection, dating to the Late Han Dynasty, 0-200 AD. A terrific Jade carving pendant of a Zoomorphic beast - in between a fish and a bird. 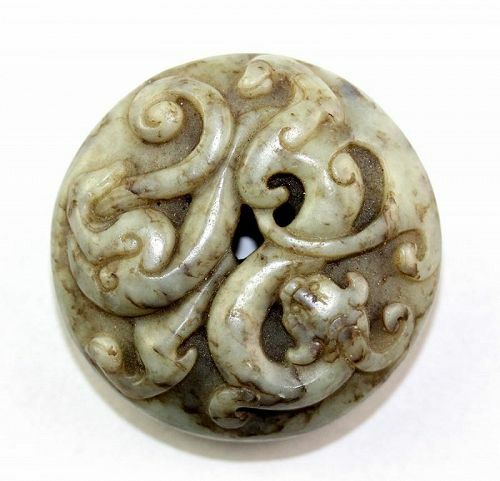 Carved in beautiful mottled Nephrite Ochre-brown and white jade, in a great archaic style. Condition: Superb, fine ancient patina. Egeskov Collection, formerly in Kramers collection, a famous Danish collection from the 1930s. A rare Chinese Jade Jug, dating to the Ming Dynasty, 1368-1644 AD. A superb and beautiful Jade Jug in a celadon and black stone, finely polished to an almost glass-like degree. Size: 7 cm. wide and 4,5 cm. tall. 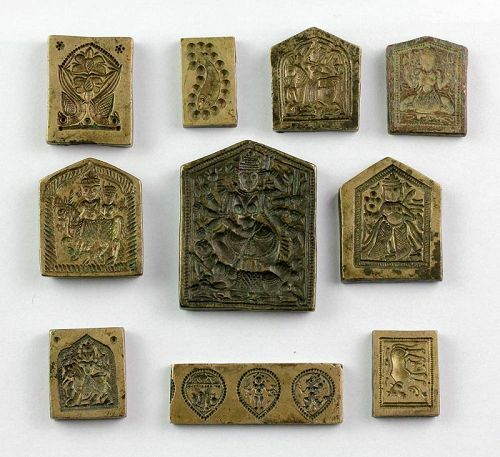 An interesting collection of 10 Indian Hindu brass 7 bronze seals, most dating 19th. century, a few are from the 20th. century. Images of gods and symbols, possible for religiuos jevellery making. The center seal is the best. A large seal seal and of higer age, perhaps 18th.-19th. century. Size: The largest seals measure 5,7 cm. Condition: Choice with nice old patinas and the original tags from a German dealer on the backside. 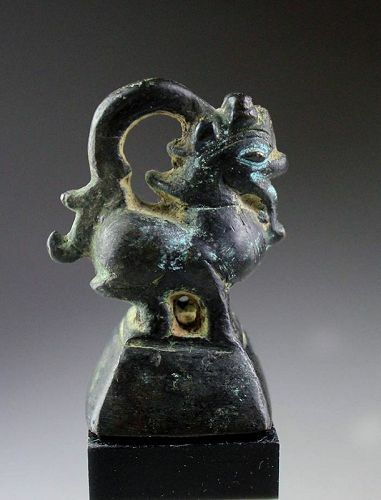 Very rare thick gilt bronze Saddle fitting, Chinese Han Dynasty, 200 BC-200 AD. A finely made piece shaped as a Dragon with a ring below and a button on the back. Condition: Superb, almost fully preserved thick gilt, typical for the genuine Han period pieces. Provenance: Egeskov collection, formerly in several famous collections and comes with a COA.